If your range doesn't allow lead nosed ammo or you simply want to keep your lead exposure down, this ammo is perfect for you. Cost-effective yet reliable, these .357 Magnum cartridges fire a heavy 158 grain full metal jacket bullet and deliver excellent accuracy at typical revolver and carbine shooting ranges. 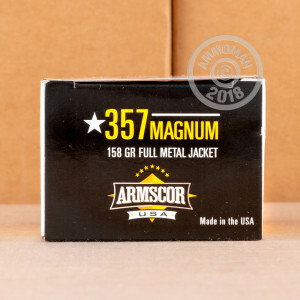 This ammunition is loaded in Stevensville, Montana by Armscor USA using non-corrosive Boxer primers and brass cases. 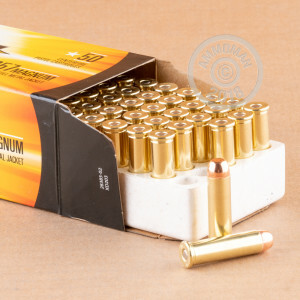 Grab this 1,000 round case of ammunition and enjoy free shipping from AmmoMan.com (as with all orders over $99). Ran 100 round trough my S/W 686 with no problems at all, would purchase again. I have had good reliability and performance with this ammo.